Working handstands, hand walking, balance work, one arm balance work, and pressing to a handstand are important as they develop your athletic potential and are essential components of spatial awareness and overall strength. There’s nothing more powerful than learning how to get in an inverted position and making that skill a mainstay. 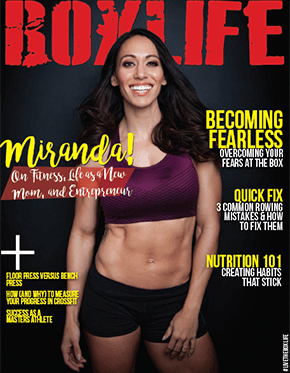 Get the digital edition of BoxLife Magazine. Just $9.99 for a 1-year subscription. Own it people…you can thank me later. Historically, these exercises collectively referred to as “balance work”, have been an integral part of strength within training armies and cultures since antiquity. As of late, balance work has made a massive return in large part due to an emergence of discovery that such skill set training opens many doors to overall fitness and health. There is an amazing transference from such basic work to overall movements found within and outside of CrossFit. What was a dying art has returned with a vengeance – and good thing it has. The most difficult part to overcome is the fact that many of us were able to achieve this balance work as children but are no longer able to as adults. It’s time for you to find that inner child and kill that fear demon that may be holding you back. The benefits of hand balancing include improved balance, increased shoulder strength and body spatial awareness, among other unique advantages. There are countless ways to increase shoulder strength and balance, but training the handstand and presses to the handstand improves kinesthetic potentials in a variety of other sports and fitness work not to mention the improvement of solid core strength. Being upside down may expose a person to what may seem as a whole new world. At first, the movements may not be easy and will take work. However, once you’re inverted and have solid control and stability, the handstand can be considered a resting position. Yes, when done correctly, the handstand is a balance move that requires much less strength than it seems when you first get up there. What’s at hand here and what’s at the heart of CrossFit is understanding human movement and relating it to optimum performance training. So in a sense the handstand position and its related skill set apply pure CrossFit methodology—and we have known this all along. For the gymnastics coach and hopefully now the CrossFit trainer, the goal of an optimal handstand position is black and white. When cued and performed properly, the handstand should place the body into an inverted, dynamically efficient and stable position where balance is the key focus, and strength, while an important factor, almost becomes secondary. Head is in a neutral position to keep your hollow position. Avoid overarching your head or spine. Upon accomplishing a solid handstand holding good balance, you can walk with much more ease as you shift weight from a strong arm, shoulder and hand to the other. Your goal is an inverted lockout in balance, where, if you look down the side of your body, you will see toes and ankles over and in line with the knees, hips, shoulders and hands. The modern handstand used today for an inverted position requires understanding of the hollow bracing for this isometric hold. This is a far cry from the old days where full blown arches and closed shoulder angles were used in controlling “old school handstands” of a dated gymnastics era. Set up on a plyo box with your hips over your shoulders, arms and hands. Keeping good form, learn to shift your weight, moving your hands to walk around the box. Remember to stay in your original set up position and close to the box with your hips aligned over your hands. Don’t let yourself walk out and away from the box as this will leave you out of your original stacked position. Against a wall, get into a handstand with solid form, stacked properly over your hands. Shift your weight from one side of your body to the other. As you shift, quickly lift your hand and touch your shoulder. Shift again and allow the body weight to transfer and touch the other shoulder. This simple drill will allow for you to work the tight handstand form of a hollow brace and keep inverted stack alignment while using the wall as a scale. You’ll feel what it’s like to lightly shift your body weight and move your hands at the same time. After you’ve mastered the shoulder touch, put it into practice by shuffle walking. To shuffle walk is to walk side to side along a wall – always working solid form in your handstand. First, shuffle walk with your back against the wall. As you become more proficient, try the shuffle walk with your chest against the wall, by cartwheeling alongside the wall or walking backwards up the wall. Before trying to balance and move on your hands, it’s recommended to have already acquired the basic strength and balance skill set previously reviewed. Get out on the floor and kick up into a controlled handstand. As you begin walking, pick up your hand just enough to shuffle while maintaining a good stacked inverted form. You don’t need big or wide moves of the hand/arm. Break it into small movements at first and work the balance as you slightly shift your weight from left to right. Work the balance until your body is no longer forcing pressure fully on your hand and you’re able to move forward. With repetition and good skill form training, your walk will come along nicely. Set realistic goals and build your skill daily, increasing the amount of time you’re inverted and the distance you reach. Some people like to crane or stretch their neck so they can look toward the ground or where they’re headed. However, the more you crane your neck the more you will arch your neck and spine as you fight against that solid hollow brace. I recommend not over craning your neck, but do find that happy place where you feel comfortable. And, yes you are more than allowed to look toward the floor as a focal point of reference if you wish. What you really want is your hollow brace to have good stability and a good stacking habit of feet over knees, knees over hips, hips over shoulders, and shoulders over hands. Understanding how the hollow brace is used to keep stability and training the skill will allow it to become as second nature. Taking in and studying this technique will help you see form and skill training as a means to your ultimate goal in inverted positions – control!